The reality of how insidiously advanced Big Brothers technology is for controlling "We The People" is captured at least to a lesser degree in the video. One would have to be completely blind and daft to not see the intention of the Elite. I updated with VC's perspective and the video. Argus Panoptes is the name of a giant of Greek mythology who had a hundred eyes and who was said to be “all-seeing”. What an appropriate name for DARPA’s latest wide area monitoring system, described as the “next generation of surveillance”. 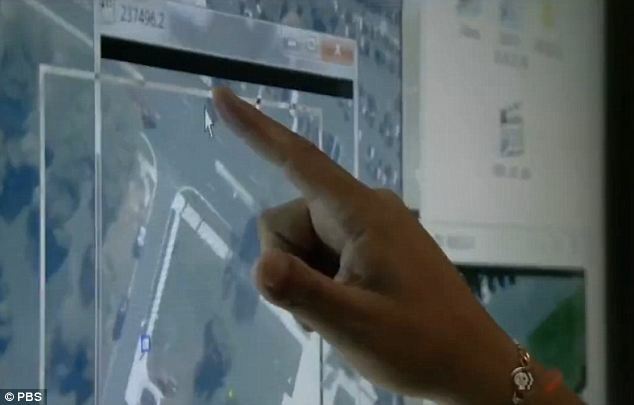 When mounted on a drone, ARGUS (which stands for Autonomous Real-Time Ground Ubiquitous Surveillance Imaging System) has a 1.8 Gigapixels video system that allows the constant video surveillance of a small city, complete with the tracking of moving objects and incredible zoom-in capabilities. Here’s a short video describing the basic (and non top-secret) capabilities of this technology. As you’ll see, the guy in the documentary refuses to say where this system is used. One thing, it is used and most probably on civilians. The All-Seeing Eye is not just a symbol, it is a goal the powers that be are striving to achieve. 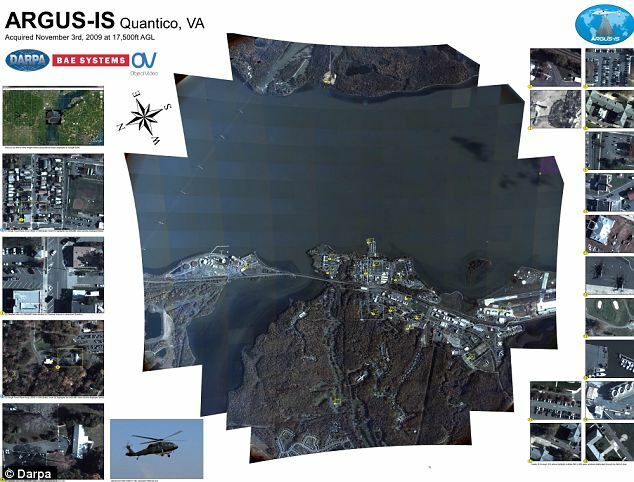 A sinister airborne surveillance camera gives the U.S. military the ability to track movements in an entire city like a real-time Google Street View. The ARGUS-IS array can be mounted on unmanned drones to capture an area of 15 sq/miles in an incredible 1,800MP - that's 225 times more sensitive than an iPhone camera. From 17,500ft the remarkable surveillance system can capture objects as small as 6in on the ground and allows commanders to track movements across an entire battlefield in real time. 'It is important for the public to know that some of these capabilities exist,' said Yiannis Antoniades, the BAE engineer who designed the system, in a recent PBS broadcast. 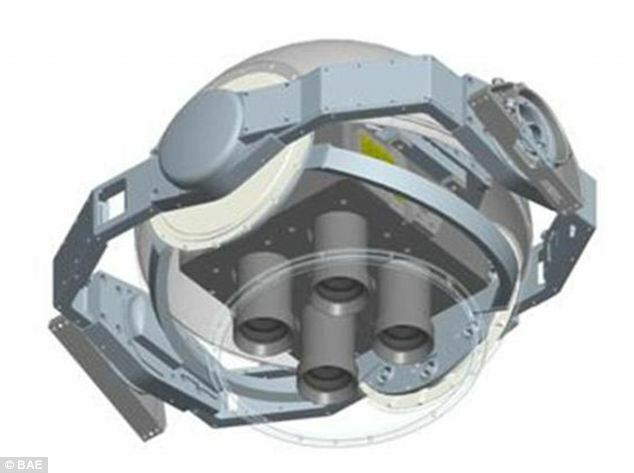 The aerospace and weapons company developed the ARGUS-IS array as part of a $18.5million project funded by the Pentagon's Defense Advanced Research Projects Agency (Darpa). In Greek mythology, Argus Panoptes, guardian of the heifer-nymph Io and son of Arestor, was a primordial giant whose epithet, 'Panoptes', 'all-seeing', led to his being described with multiple, often one hundred, eyes. Like the Titan of myth, the Pentagon's ARGUS-IS (a backronym standing for Autonomous Real-time Ground Ubiquitous Surveillance-Imaging System) works by stringing together an array of 368 digital camera imaging chips. An airborne processor combines the video from these chips to create a single ultra-high definition mosaic video image which updates at up to 15 frames a second. That tremendous level of detail makes it sensitive enough to not only track people moving around on the ground thousands of feet below, but even to see what they are doing or carrying. The ARGUS array sends its live feed to the ground where it connects to a touch-screen command room interface. Using this, operators can zoom in to any area within the camera's field of view, with up to 65 zoom windows open at once. Each video window is electronically steerable independent of the others, and can either provide continuous imagery of a fixed area on the ground or be designated to automatically keep a specified target in the window. 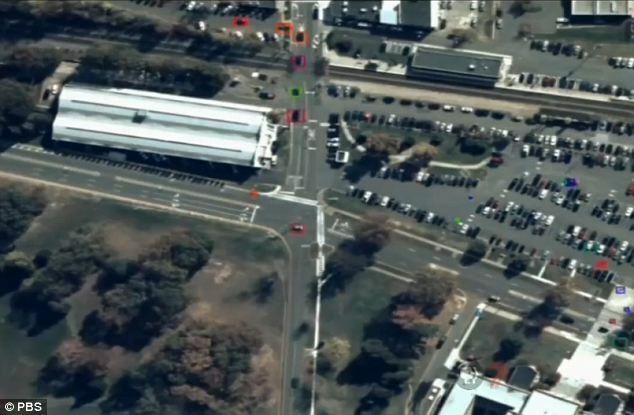 The system automatically tracks any moving object it can see, including both vehicles and individuals on foot, highlighting them with coloured boxes so they can be easily identified. It also records everything, storing an approximate million terabytes of data a day - the equivalent of 5,000 hours of high-definition video footage. 'So you can go back and say I'd like to see what happened at this particular location three days, two hours [and] four minutes ago, and it will actually show you what happened as if you were watching it live,' said Mr Antoniades. 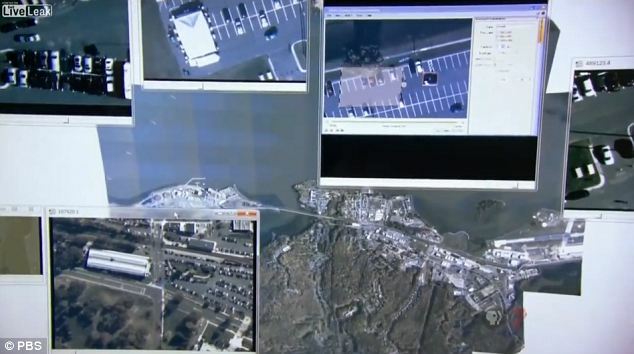 For the PBS programme reporting the technology, Mr Antoniades showed reporters a feed over the city of Quantico, Virginia, that was recorded in 2009. The technology has been in development since 2007 but authorities are staying tight lipped about whether it has yet been deployed on the battlefield. 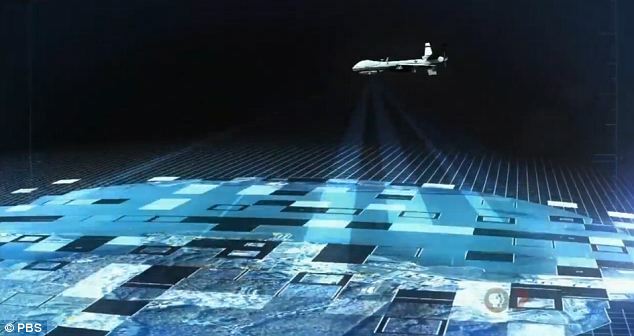 Dr Steven Wein, director of optical sensor systems at BAE Systems, said: 'The ARGUS-IS system overcomes the fundamental limitations of current airborne surveillance systems. 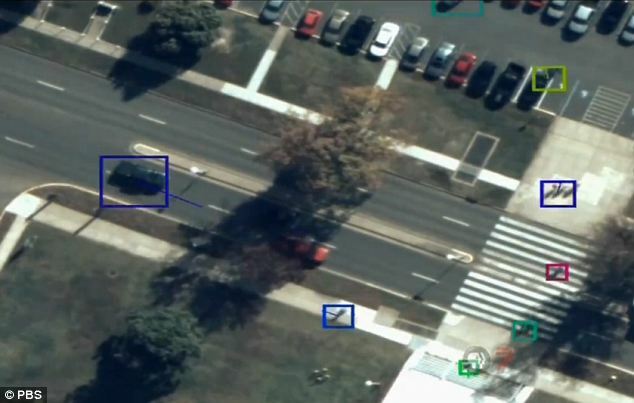 'Very high-resolution imaging systems required for vehicle and dismount tracking typically have a "soda-straw" view that is too small for persistent coverage. BAE are now said to be working on an infra-red version of ARGUS that would allow commanders total surveillance of an area even at night.